Motherwell's Scottish Premier League survival lies further in the balance after they went down to a Grant Brebner penalty at Easter Road. With Dundee United edging further clear of the bottom side with a win at Livingston, it is looking more likely that Motherwell will have to rely on a vote of SPL chairmen to avoid relegation. Motherwell rarely threatened and will nervously watch as the top flight clubs decide whether Falkirk will be allowed promotion while groundsharing with Airdrie United. Hibs have now won three games in a row as they look to end a disappointing season on a high note and can take comfort from some encouraging displays from their youngsters. Easter Road boss Bobby Williamson was forced to make a late change, when wing-back Alen Orman suffered an epileptic seizure during the warm-up and was replaced with 18-year-old Steven Whittaker. Williamson had already made several changes, first-choice goalkeeper Nick Colgan being dropped to the bench in favour of Daniel Andersson. 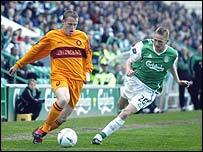 Injuries to Yannick Zambernardi, Garry O'Connor and Tom McManus paved the way for youngsters Derek Riordan and Scott Brown to start. Motherwell boss Terry Butcher was also forced to make changes after David Cowan broke his leg and Derek Adams was sent off in the midweek defeat by Celtic. Hibs had the first chance of the game after three minutes, when Grant Brebner tried to lob Francois Dubourdeau but the goalkeeper managed to block the effort. A Derek Riordan free-kick picked out Scott Brown at the near post and the young striker would have netted the opener had he not been denied by the Motherwell goalkeeper. Hibs had claims for a penalty waved away when Riordan appeared to be hauled down in the area by David Partridge. Brown then wasted an opportunity to put Hibs ahead when he bulleted his header just wide of the post. The home side had another decent chance when Riordan burst past Partridge into the box, only to be denied by Dubourdeau, who raced off his line to block at the youngster's feet. Brebner broke the deadlock from the penalty spot after 64 minutes, when Ian Murray was brought down in the box by Partridge. Motherwell captain Scott Leitch was fortunate referee Willie Young did not spot his head-but on young Brown when the award was given. Hibs went in search of more goals and Riordan almost added his name to the scoresheet with a decent shot but the effort took a deflection and fell wide. Riordanshould have killed the game off with four minutes to go when he went on an amazing run only to see his shot smack the post. Motherwell staged a late rally and James McFadden and Steven Craig both went close to finding an equaliser in the dying minutes but Andersson was equal to their efforts. Hibernian: Andersson, Smith, Fenwick, Doumbe, Whittaker, Jack (Wiss 83), Brebner, Murray, Matyus, Riordan, Brown (Reid 89). Subs Not Used: Colgan, Townsley, Nicol. Booked: Fenwick, Jack, Brebner. Motherwell: Dubourdeau, Vaughan (Craig 87), Partridge, Ramsey, Corrigan, Lasley (Clarkson 72), Leitch, Pearson, Hammell, Lehmann, McFadden. Subs Not Used: Woods, McDonald, Kinniburgh.